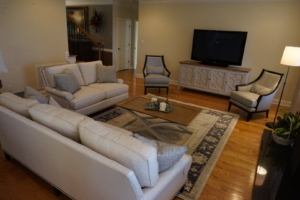 Here is a living room design which we recently completed. The homeowners old living room furniture was in a darker color scheme, more traditional patterns, as well as lots of brown wood tones. The design goal was to update, brighten up the room, make it more transitional, non functional window coverings, and seating for approximately 6 people. 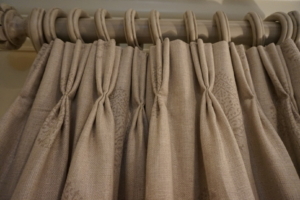 We were able to reuse the old drapery hardware, we hired our friends from The Painted Room here in Knoxville, TN who always does an outstanding job for us. Not only were we able to get exactly the color scheme that we were looking for, but we were also able to save some money and put it towards new furniture. 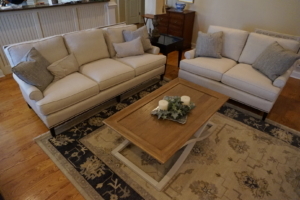 Our sofas and side chairs are from Taylor King ( we are a local dealer in Knoxville for Taylor King), the rug is from Surya and our new casegoods are from Universal Furniture. 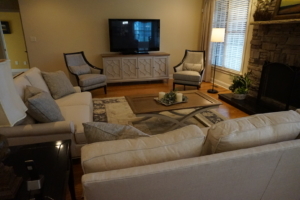 We especially liked the lighter color scheme on our TV console and the matching coffee table. 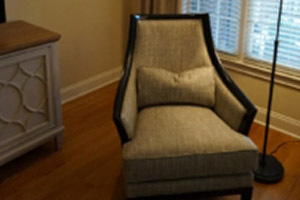 We also fabricated pillows in our own custom workroom with the same fabric as the draperies, and a floor lamp from Visual Comfort was placed next to one of the accent chairs for additional lighting.